[/caption] Beautiful sunny day in the Mt. Hood Wilderness with views of Mt. Hood and a very stubborn cloud that refused to allow me to take a cloudless photo! This photo was taken at Trillium Lake last Saturday and as you can see it was a pretty nice and sunny day except for the dark grey cloud hanging around the mountain. To get this shot I attached my Canon 25-135mm telephoto lens and set the focal length at 95mm in order to get the best photo of the blue sky, mountain, cloud, forest and trees in the foreground. There were so many snow-shoers and x-country skiers on the frozen lake that I wasn’t able to take very many shots with the frozen lake in the foreground. I ended up zooming in on most of my photos and concentrated on the cloudy mountain and the snow covered trees. I know that weekends can get pretty busy anywhere near Mt. Hood but Trillium Lake was more like Disney Land during peak season. [/caption] Early spring offers a great view of Mt. Hood from the banks of snow covered Trillium Lake in the Mt. Hood National Forest. 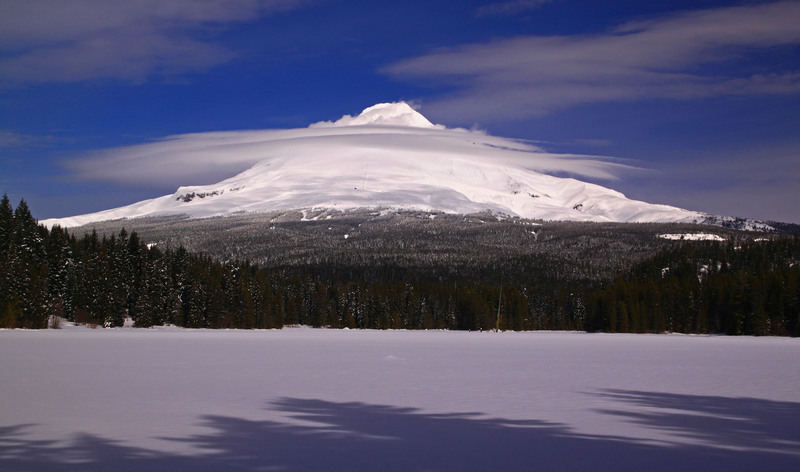 Trillium lake is located on the south side of Mt. Hood and the sun travels directly behind you when facing the mountain. Your best opportunity for getting great shots is either in early morning or early evening. However, winter and early spring doesn’t always give you a good window of opportunities due to the unpredictable nature of the weather. It’s about a 6 mile round trip snow shoe trek from the snow park and it will take you about an hour to get to the banks of the lake. This photo was taken at about 11:55am and the sun was just behind the trees directly behind me. The shadows in the foreground are from the huge trees directly behind me. I set the camera setting to normal/program mode and the aperture was at F-9.1 and the shutter speed at 1/250 second. I attached my CIR-PL, warming filter and UV filter to my Sigma 17-70mm lens. I set the focal length at 28mm and set the ISO at 100 and the white balance at 0 due to the brightness of the sky due to the albedo/reflection caused by the snow covering the lake. I was also using a tripod and bubble level to avoid and camera shake. The best time to visit Trillium lake is just after a huge snow storm and the entire forest is blanketed in snow. 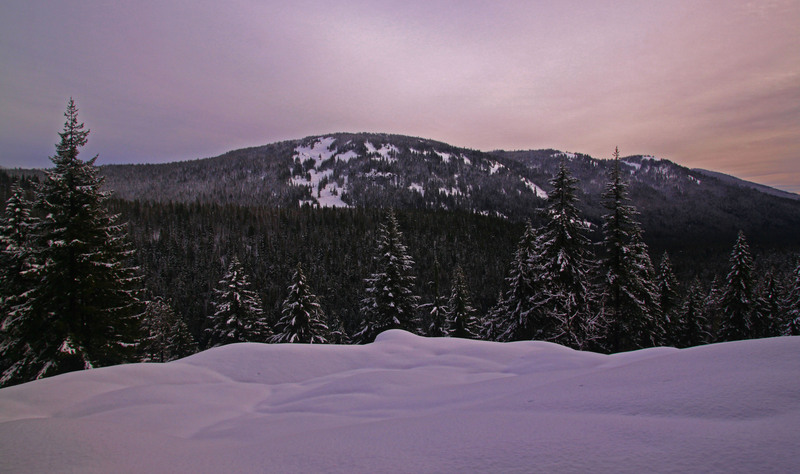 [/caption] Who’s ready for the ski resorts in the Pacific Northwest to open already? After we received our first snow storm in late October we have been patiently waiting for the intense pounding of the fresh white stuff. However, we have been getting a mixed bag of rain and snow in the higher elevations. It’s only a matter of time before winter comes in full force but I’ve already completed my first snow-shoe journey and I’ve eagerly taken out my snow-board gear. I took this shot a few weeks ago while visiting Trillium lake. You can see Timberline lodge in the lower right side of the photo and you can see just how awesome Mt. Hood can look once it’s covered in snow. To get this shot I was standing on the far end of the lakes edge and made sure to use my tripod, bubble level and remote switch in order to avoid any shake. I was using my Canon Rebel T1I and my Canon 55-250 telephoto lens. The focal length was set at 131mm in order to keep the mountain in the foreground without showing any of the green vegetation showing in the lower elevations. I was using my UV, warming and my CIR-PL filter since I took the photo at 11:20 am and the sun was fairly bright even though the edges of the lake were shadowed by the trees. The F-stop was at F-8 and the shutter speed was 1/400 second. I set the ISO to 100 and the white balance to 0. I again had the camera set in the Program mode. The best thing about this photo is that there are only a few shadow’s showing along the mountain. This allows you to see all of the crevices and little peaks near the higher elevations. You can see where the Palmer lift ends as well as the vapor vent in the upper right side of the photo.